You can see the 2016-17 roadmap here on ProductPlan, or download it as a PDF. As always, items on the left are more certain than those on the right, and the roadmap as a whole will be thoroughly reviewed each quarter. The major focus of our improvement effort this year is to make it possible for organisations across government to join their content together as coherent services for users. These are big, transformational changes. The roadmap shows in more detail all the things we need to do to achieve them. Our hope is that, by the end of March 2017, we'll have everything in place on GOV.UK and agreement and commitment across government to begin a co-ordinated programme of transforming and recategorising all government content. It's a task comparable in scale to the original programme of transitioning content onto GOV.UK. While working on those big changes, we’ll continue to iterate toward the vision in other ways. 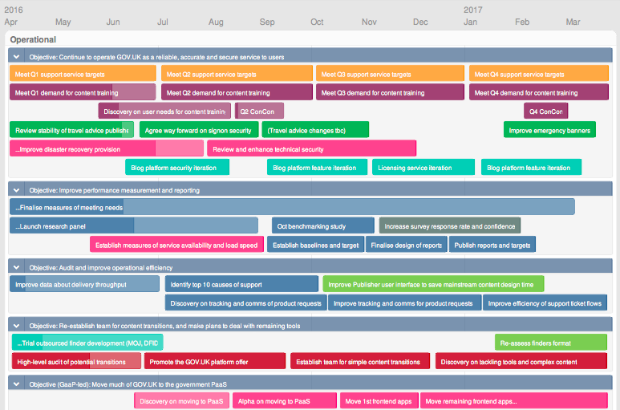 We’ll also continue to operate GOV.UK as a reliable, secure, accurate service to end-users and government colleagues alike, and there’s work on the roadmap to improve how we do that. We’ll keep ProductPlan updated with the progress of each item on the roadmap, and continue to publish “what we’re working on” posts with the lower-level details every 2 weeks or so. We've been working to this plan since April (before we were quite ready to publish it) and are currently on track to deliver everything we'd planned for this quarter. We'll review the whole plan in July and make any adjustments needed - and blog again if those changes are significant. You guys so out of touch with what has already take years of research and working with uk based very adopters. No code rapid build of any digital service at last a 6GL supporting Adaptive capability...do you even know what that is...?